Former Manchester United coach Brian Kidd is eager to get back into football after recovering from prostate cancer. 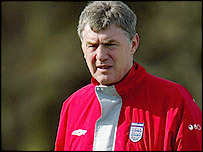 The 56-year-old also managed Blackburn Rovers and was part of the England backroom coaching staff. "The good thing is I am fit and healthy again and, as the signs outside the shop say, open for business," Kidd told the Manchester Evening News. "I do believe that young players can benefit from my years in football at various levels." He added: "Money cannot buy experience. I just need another door to open for me. "Coaching players, young or old, is what I am best at and I would love to get back into the game in that capacity."